You become the angler, your perfect opportunity. A guided trip with Captain Todd usually starts early with a rendezvous at a convenient location, followed by a ride to a boat ramp in the area the Captain has selected for the day of fishing. Where Captain Todd fishes is greatly influenced by weather and fish patterns. Unlike a lot of guides who fish out of a specific resort or marina, the captain is not locked into one location. This gives the anglers the greatest chance of success. After the skiff is launched, Captain Todd heads for the first stop of the day, often an opportunity to cast to rolling tarpon while waiting for the sun to rise. 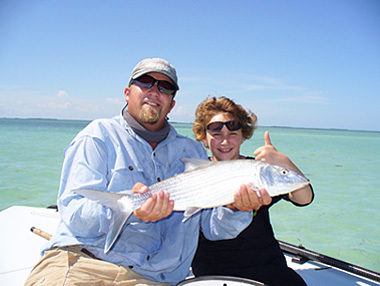 Depending on the season and the tide early morning fishing may include casting to tailing bonefish or permit. Captain Todd will silently pole the skiff across the shallows in search of fish. You the angler, will be positioned on the bow of the skiff, waiting for the perfect opportunity, Like when a school of bonefish move across a white sand area on a flat, or when then are revealed by nothing more than “nervous water” or “muds” – small puffs of stirred up bottom created by foraging fish. One of the most exciting experiences is a “tailing fish” where a feeding fish puts its head down to forage for small shrimp and crab, and its tail is out of the shallow water. Stalking fish in shallow water skiff is a thrilling experience particularly when a good cast produces a hook up where the fish speeds across the flats, often taking more than 100 yards of line. Typically, but not always,, the Captain is the first to spot a targeted species. The Captain quietly poles the skiff into position to give the angler the best casting angle, and then from that point forward, success is largely a matter of the accuracy of the anglers cast. A good cast will result in a “fish on” as the fish streaks a hundred or more yards at astounding speeds. And so it goes, flat after flat, fish after fish, cast after cast. All the time, in the context of a special kinship between guide and angler and in a natural environment of extraordinary beauty. Todd views his job as fishing WITH his clients not just for them; and when he has a day off,, he does what he loves, he goes fishing. One aspect of Captain Todd’s approach to fishing with his clients is that he is a great teacher – whether the angler is a young child on his first shallow water fishing trip, or a fly fisherman who needs a refresher lesson to improve his loop or increase his accuracy. When he has a chance to do so, Todd is an outstanding fly caster, who loves to pass on his expertise.